Okay. I think I have a problem. Recently, I started getting into piercing my ears. It started innocently enough, with a cute little white opal gracing my right anti tragus, but as soon as I walked out of the studio, I was ready for another one (as stated in my previous post - linked here.) I knew, however, my income as a server wasn't high enough to support two piercings with high-quality service and jewelry in the same day. So, naturally, I waited a month to go back in and get things checked out, mostly because my new piercing was being a little pissy, probably from being bumped around and hair products. Mathieu, the piercer at Studio 51/50 and possibly the best in Nebraska, said I had some hypertrophic scarring going on & suggested chamomile soaks. Honestly, soaking my ear with a tea bag was not what I had expected. 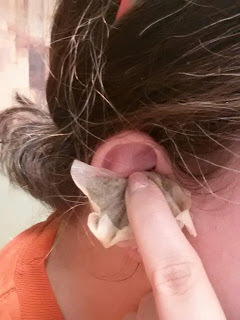 It's super soothing and it seems to be reducing the irritation. I can hear the ocean! Anyhow, chamomile's been working wonders. So, while I was in there, getting my month-old piercing checked, I decided it was a waste of being in there if I didn't get another one. I originally wanted a snug or an orbital helix, but Mathieu advised against it and suggested a faux snug: a conch piercing and an auricle piercing to give the illusion of a snug. I was all in, so I started with the conch. 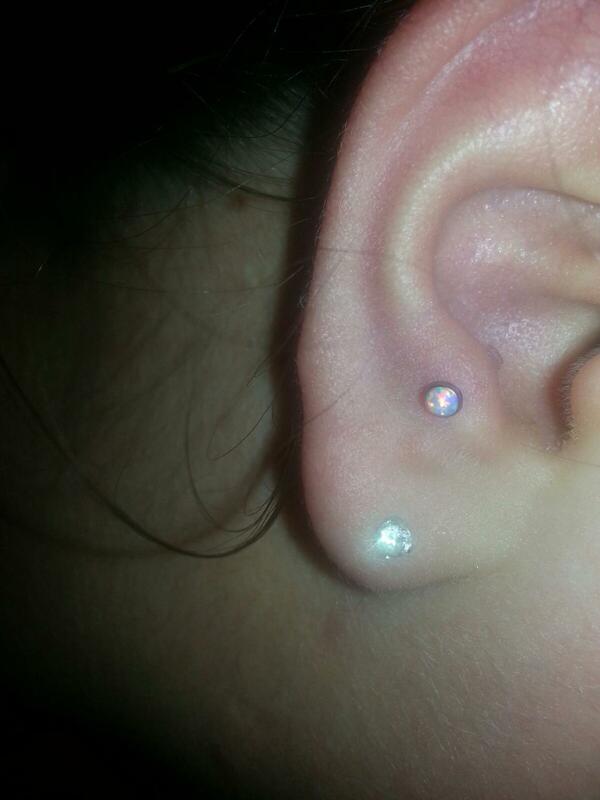 This one was a little bit different than my anti tragus. For the anti tragus, it was a quick pain, me saying, "Oh, there it is," and the agony of putting in the jewelry. I'm being dramatic. It wasn't that bad. On a scale of 1 to 10, I'd say the pain was around a 6. For the conch, he used an o-needle. Needless to say, I wasn't expecting what happened. There was a loud crunch, me saying, "Oh, gross!" and that was it. It was like, CRRrrreeuuhngkggkgkh. Gross. It didn't really hurt, probably a 4/10. Naturally, more white opal. Please excuse the blood. This is around 1 hour after I got it done on Saturday. I can't wait to go back and finish the piece. 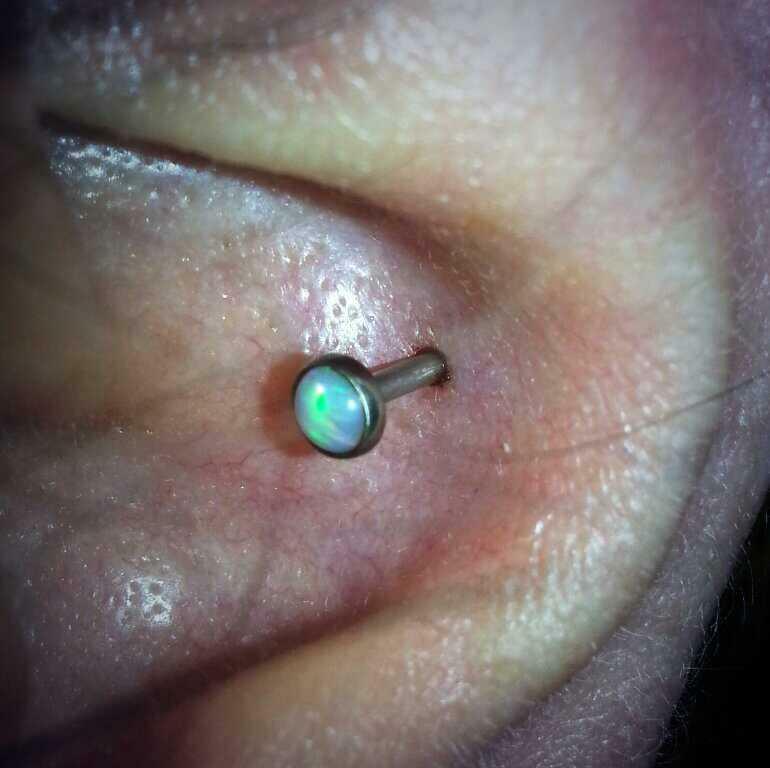 Imagine another white opal to finish that bad boy off. Also, something else that's been happening that I love, my friends have been asking me to go with them to get their piercings. Yesterday, I went in with my friend, Jenni, while she got a cute little rook piercing. I think I'm too much of a wiener to get that one done. 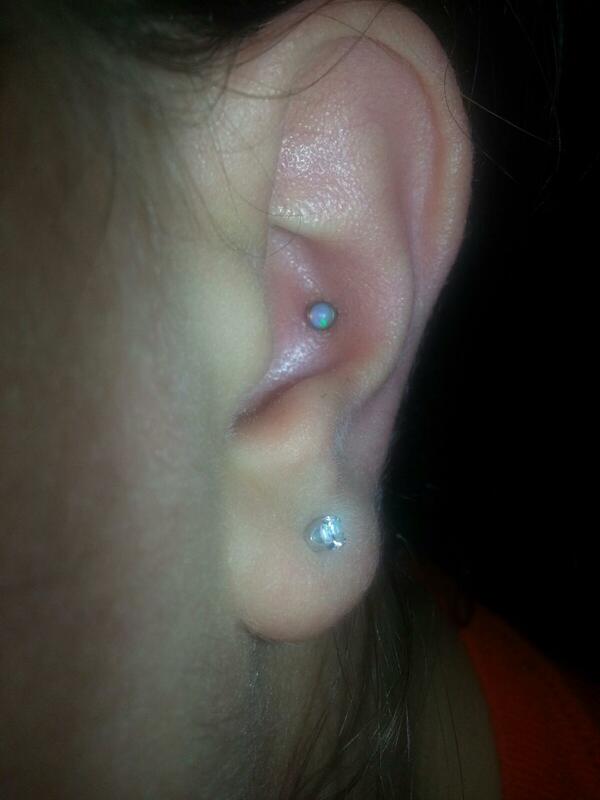 (: She took it like a champ and chose a beautiful curved barbell with light blue gems. I think we're going sometime next month to get another one. 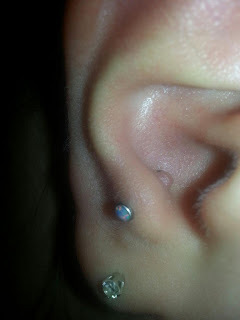 I can't decide if I want to finish my faux snug, get a daith piercing, or my second lobes. Also, I have a question: would it be too weird to get my second lobes done, and stretch them to around a 6g or so, and leave my first ones small? I like dangly earrings too much to stretch my first lobes. . .
Whatever. I'll figure it out. I think this is something I could get really passionate about.